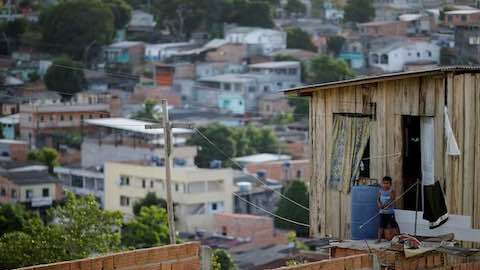 As the world's giant cities fill up, the brunt of migration to urban areas will fall on smaller cities that are not ready to deal with big influxes of people, a specialist on Latin America's cities has warned. "The cities that are set to grow are those that are not prepared to grow -- the medium and small-sized ones," said Eugene Zapata Garesche, Latin America and Caribbean director for the 100 Resilient Cities (100RC) initiative. "The cities that got prepared to grow are not growing anymore as they are already big enough. That is where the whole challenge of urbanisation is sitting today," Zapata told the Thomson Reuters Foundation in an interview. As megacities such as Brazil's Sao Paulo can no longer sustain more population growth, cities like Curitiba or Salvador, which still have room to expand, will be required to absorb rising numbers of people, said Zapata. "You have cities like Mexico City that aren't even growing any more population-wise, because the city has turned into a nightmare for commuting, and there's a lot of pollution," said Zapata, a native of the city which ranks among the world's most congested. "It's good news for Mexico City, but bad news for the cities around," he said, adding that smaller cities such as Querétaro to the north are now experiencing growth. The United Nations estimates the number of people living in medium-sized cities of up to 5 million inhabitants is expected to jump to 1.1 billion by 2030, up from 827 million in 2014. And it predicts an estimated 27 percent of the world's population will be living in smaller cities of at least 1 million people by 2030. In Latin America, where 80 percent of people are urban dwellers, 17 cities -- including Mexico City and Rio de Janeiro -- have signed up to the 100RC initiative, which is backed by a commitment of $164 million from the Rockefeller Foundation. The funding pays for cities to appoint a chief resilience officer and develop a strategy to deal with challenges such as climate change. Cities -- including Santiago, Quito, Cali in Colombia and Ciudad Juarez in Mexico -- are expected to release strategies this year detailing plans for long-term urban resilience. Panama City, Buenos Aires, Montevideo, Salvador and Mexico's Guadalajara are still in the earlier stages of the process. "Resilience is not an easy thing to push forward. There has to be willingness and capacity... within the government," said Zapata, who will head up a regional office for 100RC opening in Mexico City later this year. Making sure resilience is institutionalised by cities and supported by legislation is essential to guarantee the long-term continuation of the strategy, irrespective of political handovers or ongoing support from 100RC, he said. The biggest resilience challenges for Latin America's cities are improving transport and waste management, and securing water supplies, along with social policy issues such as supporting migrants from different parts of the continent, he said. The 100RC initiative aims to give "mind space and oxygen" to the 17 cities signed up in the region so that they can prepare themselves for the future and "think differently" over a horizon of 20 to 30 years, he added. Finding ways to craft a model of metropolitan governance is crucial in the region, where national governments have been reluctant to hand over power to local authorities, he said. Tackling the violence and corruption that plague many cities in the region is another key building block for urban resilience, said Zapata, who referred to issues facing Rio de Janeiro in southeast Brazil and Santa Fe in northeast Argentina. While Mexico's Ciudad Juarez, once ranked as the world's murder capital, has seen a dramatic fall in crime, Rio has experienced a spike in violence in its sprawling favela slums and Santa Fe is battling a rise in the drug trade as Argentina has become a major cocaine trafficking point. "There are violence problems in all of our cities," said Zapata. "But this is part of our resilience strategy -- we take into account these problems and integrate them into our thinking." Latin America: "Small Cities Unprepared for Population Flood"